"The Easy Way To Plan Your Trip"
There's a certain magic in the air in Sitges. The whitewashed coastal town lies on the Costa Brava, approximately 30km South of Barcelona. For decades Sitges has been a meeting place for people from all walks of life. A sophisticated getaway for young and old, gay and straight, families and friends. The town is full to bursting with classic art deco buildings and the seafront promenade is lined with palm trees. Its 17 beaches are some of the best on the Mediterranean coastline. In this guide you will find comprehensive and practical information covering most aspects of your visit to Sitges. Our aim is to make your holiday experience as simple and enjoyable as possible and to give you the power to arrange your entire holiday for yourself. We have done the practical work for you. The information provided in this website (including times, prices and addresses) is checked on a regular basis, so there is no need to worry about facts being out of date. You will also find that all of the information provided in the guide is balanced and unbiased. 2. If you are in search of a more specific topic you can use the search box at the top each page on our website. 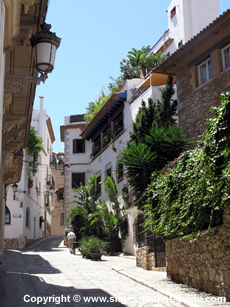 Thanks for visiting us and we hope you enjoy taking a look around to discover what Sitges has to offer you.